Apply to become one of 25 Green Talents 2016 and win the opportunity to promote and conduct your outstanding research in Germany. 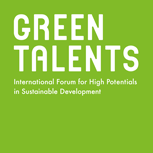 Bonn – The deadline for submissions to the “Green Talents – International Forum for High Potentials in Sustainable Development” is drawing closer. Young scientists working towards a greener planet and a more sustainable world can apply online until 24 May, 12 p.m. CET at www.greentalents.de. As every year, the German Federal Ministry of Education and Research (BMBF) looks for 25 outstanding young researchers from around the world. The Green Talents, selected by a jury of renowned German experts, come from various scientific disciplines and are recognised for their outstanding achievements and contributions to making their communities, countries and societies more sustainable.